Systems that rely on hydraulic power operate based on the principles of fluid mechanics, meaning that fluids are stored under pressure; when force is applied to one area it is transmitted to another area by means of the fluid. The use of fluid makes this process very efficient, and the force that is applied is in almost all cases multiplied, which makes hydraulic lifts popular for heavy-duty applications. Hydraulic lift systems are frequently utilized in industries such as: automotive, for parking lift systems, braking systems and other power transmission applications; industrial manufacturing, in a variety of process and assembly machinery; construction, for the lifting of heavy building materials such as concrete, stone and brick; steel mills, for the transport and processing of steel; and marine, for applications such as off-shore mining and off-shore pipelines as well as steering and braking systems for marine vessels. In addition, hydraulic lift systems do not require all lifts to be hydraulically-powered, but can also integrate various types of machinery that are not-powered by hydraulics; for instance, they could be electrically powered. Available in a wide variety of configurations, hydraulic lift systems can be adapted to fit the specific needs of the application. As an example, while the agricultural industry often requires large, heavy-duty hydraulic lift systems for the positioning of combine headers or plows, the medical industry requires much smaller hydraulic lift systems for use in applications such as patient, bed lifts or scooter lifts. At their most basic, hydraulic lift systems consist of pistons, pumps, cylinders or rams and, most often, an electric battery or motor. Various types of electric batteries or motors can be used including alternating current (AC) and direct current (DC), although DC is more commonly used. The battery powers the pistons to move and the force applied by the movement of the pistons cause the pumps to function and transport the force. The transmission of the force causes the cylinders or rams to move and provides the lifting or positioning motion. The majority of hydraulic lift systems store hydraulic energy, as in the pressurized fluids, in equipment referred to as accumulators. Accumulators function to store the fluids under pressure in such instances that the hydraulic pump malfunctions, the engine shuts down or the pump is unable to keep up with the demand. 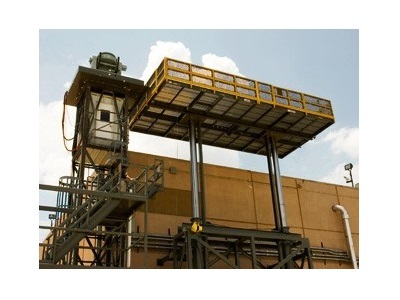 Hydraulic Lift Systems Hydraulic lift systems consist of multiple hydraulic lifts that are integrated into one cohesive system.